She's only been a royal for ten weeks, but the newly minted Duchess of Cambridge is proving she's no novice when it comes to fashion. Having mastered the art of high-low dressing by combining both designer (Alexander McQueen, Catherine Walker) with high street (her go-to label, Issa), Catherine is proving herself worthy of her fashion star title. For her trip to Canada and California, the Duchess of Cambridge traveled with nearly 40 different outfits (and without a dresser!) but was smart enough to bring her trusted hair stylist, James Pryce along. (Smart choice. What woman wouldn't want a professional blow out every morning?) Without handlers or a lady-in-waiting to keep things looking fabulous, Catherine actually pulled herself together every morning without help. This shouldn't really come as a surprise since she was brave enough to do her own makeup on her wedding day undaunted by the fact that billions of people from around the world would be watching. I've been impressed by everything I've seen her wear, but especially on this trip. As the Brits like to say, she "didn't put a foot wrong." One of the things I like best about Catherine's sense of style is that that she isn't afraid to trot out her favorite pieces again and again (like those L.K. Bennett pumps she wears everywhere). I'm not sure that makes her a royal recessionista, but it does show that Catherine is very much in touch with 'the real world' and that she wants to be perceived as a modern young woman and not a royal show pony. She is quickly establishing her signature look by selecting sleek, well-tailored pieces (that aren't necessarily expensive) usually in neutrals or jewel tones that both flatter her and photograph extremely well. I particularly liked the purple long sleeve Issa dress worn with gorgeous Prada pumps and a diamond brooch in the shape of a Maple leaf first worn by Queen Elizabeth on her first trip to Canada in 1951. Besides her Duchess of Cambridge title, Catherine seems to have inherited another title from Diana -- the Ambassador of British Fashion. While it was widely believed that Diana was required to wear clothing from British designers, it was, in fact, her choice to do so. When she wasn't wearing Catherine Walker or Bruce Oldfield, she always made sure to wear something designed by a native of the country she was visiting along with her favorite British designers. Catherine, it seems, is following suit. In Canada, she mixed Burberry, Reiss and Catherine Walker with pieces from Canadian labels. The minute I saw those first images of the Duchess of Cambridge greeting the crowds in Canada on July 1 wearing an ivory Reiss dress (the same one from her engagement photo!) 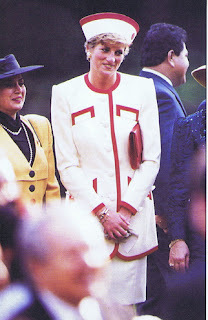 and that red maple leaf fascinator by Canadian Sylvia Fletcher at Lock and Co., I thought of the striking similarities between her look and the ivory Catherine Walker suit and ivory and red hat emblazoned with a 'rising sun' by Philip Sommerville worn by Diana in Tokyo in 1990. 'Theme' dressing for official visits was very popular with Diana during the eighties and early nineties and Catherine has adopted that rather playful tradition with the same delightful results. Fittingly during the royal couple's trip to Los Angeles, Catherine appeared at the BAFTA fete in a Grace Kelly worthy gown by Alexander McQueen very reminiscent of the diaphanous Catherine Walker dress Diana once wore to Cannes. Although flattered by the comparisons, I'm told Catherine is weary of the frequent comparisons between her and her late mother-in-law (One can only imagine what she must have thought of Tina Brown's ghoulish Newsweek cover). And so, she is caught between the proverbial rock and a hard place when it comes to her look. Since Catherine's and Diana's style is so similar, it's only natural to think that the newest member of the royal family finds some inspiration in Diana in honing her look for her life in the spotlight. While I'm sure Catherine is a great admirer of Diana, I'm also struck by the fact that unlike Diana, she came into her new role as a confident young woman who is very much comfortable in her own skin. (Can you imagine any famous actress today wearing a three year old dress for an important photograph or red carpet event?) By contrast, it was only in the last years of Diana's life that she seemed to have been at peace with herself and her looks. And that is the biggest difference between these two women who will forever be linked by history. The most attractive element in Catherine's wardrobe is her easy, relaxed confidence that she effortlessly slips into when she's out making appearances with Prince William. After watching them together on this trip, I have to say they are a positively captivating couple. She radiates with happiness; he beams with pride. No designer dress or dazzling diamond can compete with that. It's just like the old adage my mother, a former model who lived in jeans, always told me, it's not what you wear, it's how you wear it. Catherine wears her new worldwide fame beautifully. Fashion Report Card Grade: A -- For a fashion star on the rise. Lets stop comparing Kate to Diana. Kate is her own woman. Both pretty, great bodies and wear clothes well. Kate appears to have excellant taste and really knows what types of clothes are great on her and photograph well. Diane did not have all these attributes early on and she was certainly 10 years younger when she married her Prince.